The ongoing 2018-19 NBA regular season has been something out of the ordinary. While some things remained unchanged, many novel patterns emerged that are sure to run the scheme of all things NBA for the foreseeable future. One of the pleasant uprisings on the talent front has been that of the 24-year-old Giannis Antetokounmpo. From being picked first in the All-Star game last season to being named the captain of the East's All-Star squad this year around, the Greek Freak has come a long way without a doubt. On the other hand, James Harden has been putting together a show of resilience of his own, ever since the Rockets were grazing the bottom of the West standings. He has been on a rampage en route to a legit back-to-back MVP bid. 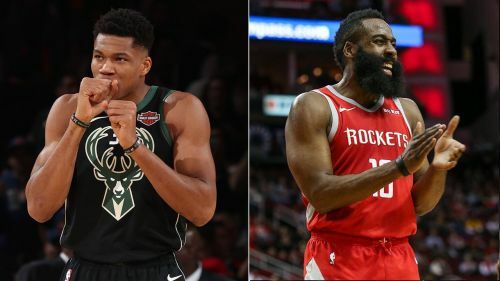 In this piece, we try and compare the 2018-19 regular season performances of the aforementioned megastars and how they stack up against each other in the MVP race. This is the fourth straight season that the Beard is averaging more than 29 points per game, setting another insurmountable career-high for himself with every passing game. In the 36 games he has started for the Rockets this season so far, Harden is scoring at an astronomical average of almost 36 points a game, playing an average 37 minutes per game as well. On the other hand, Antetokounmpo is one of the very few forwards in the league who are averaging a solid double-double on the season and doing so consistently and efficiently. He has been recording career-high numbers in points, rebounds, assists and FG%, with 11 games remaining still in the Bucks regular season. Harden took care of business on the defensive end of the floor - something he has been so heavily critiqued for in the past - as he averages a career-best 2.2 steals per game this year. The disparity in the scoring averages of the two players is something that can't be ignored at any cost. 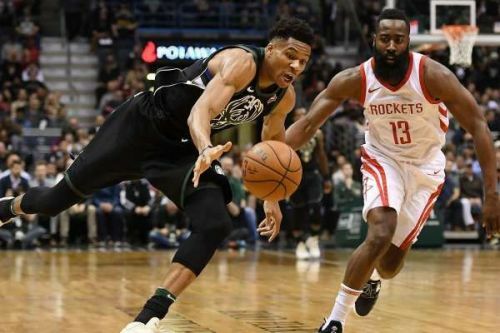 Although Giannis pulls down 12+ rebounds a game, averaging nearly 36 points across 66 games in the season would still overshadow any such accomplishment.